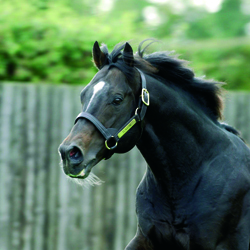 A dual Champion Sprinter by Danzig from an outstanding female line, Elnadim initially stood at Shadwell Farm in Kentucky before relocating to Derrinstown in 2002. Although restricted in the number of mares he could cover because of an earlier injury, he only once failed to come up with a Stakes performing juvenile during his whole career in Ireland. In all, he has been responsible for 11 Group winners in all, including the Group 1 winning sprinter Culminate in New Zealand, and the two-year-olds Wi Dud, Elletelle (dam of the highly regarded two-year-old, Puissant), Soraaya, Elnawin and Caldra. Despite his infirmity, Elnadim commanded a loyal following amongst breeders and, up until recently, had remained in sufficiently robust health to carry out his duties. However, age and infirmity have finally caught up with him in the form of long standing arthrosis, necessitating his retirement with immediate effect. As with previous Derrinstown retirees, he will spend his remaining years being looked after on the stud.